After last month’s record-breaking income, this month’s was a bit more average and I received £155.01. Great to see another month where I’m getting >£100 and I look forward to the day when I will get at least this every month in dividends. 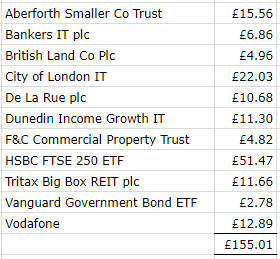 Total dividend income this year now stands at £1,209.19. so looking likely that I will hit my dividend target although that’s assuming the December dividends don’t roll over into January. With family visiting and the festival weekend, the much touted football season didn’t start off with the usual fanfare and MB-wise, definitely not with the bang I was hoping. Some of the accumulator offers which I made consistent profits on previously are no longer available and I’ve had to amend my strategy, taking more risk in the guise of ‘no lay’ accumulators, which to me feel close to gambling and I’m not 100% comfortable doing, although they do take up less time. I’ll see how I get on with these anyway and hope I can stomach the interim losses! Anyway, profits for this month? Just £150.24, which is pretty disappointing but still, better than nothing and indicative of the time I spent on MB, ie not a lot. 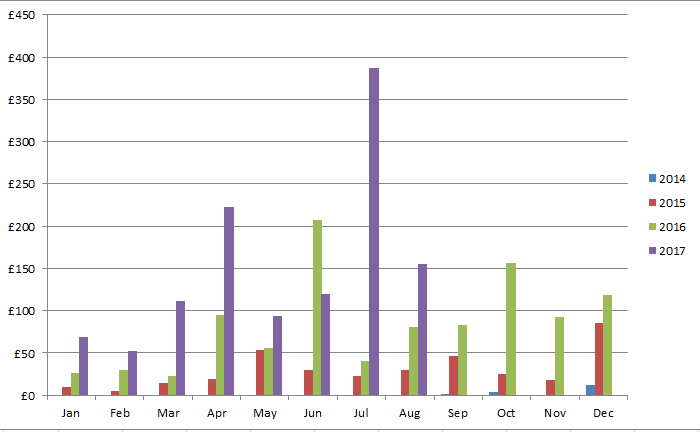 Total profits so far this year now stand at £3,500. After such a great start in the first half of the year where it looked like I was going to ace my goal, if I carry on the way I’m going now, I might struggle to get close to it! Let’s hope I have a better September and luck is with me! The matched betting guide I subscribe to is OddsMonkey*. It’s a nifty little website for beginners and experienced matched bettors alike – for beginners, there are plenty of tutorials which provide you with step-by-step guides on how to make profits and to work through special offers. They also offer one-to-one sessions for those who need a little more help. For the more experienced, OddsMonkey offers quality tools including the Each Way Matcher, Extra Place Matcher, Dutch Finder, Racing Matcher and Acca Matcher, all of which I have used successfully. There’s also a friendly forum for you to ask questions. Anyway, you can try it out for free*. I’m confident of hitting 4 of those goals but we’ll see. Another month where dividend income was greater than matched betting profits (just) – it’s great when passive income beats ‘active income’ but mixed emotions about it this time, as I really should have brought in more from MB this month. I did read a couple of books in August, but they were neither library books nor non-fiction! I should be back on track from September. Getting close to my charity goal though, I should bag that one in the next month or so. 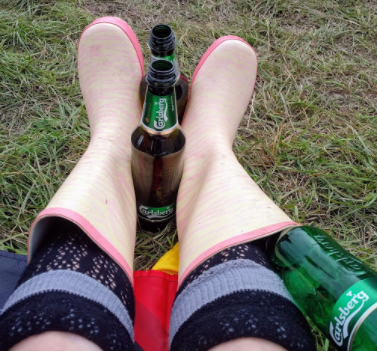 This entry was posted in Books, charity, Dividend Investing, Earnings, Expenses, Family, Funds, Investment Trusts, matched betting, Portfolio, Savings, Shares by weenie. Bookmark the permalink. Shame that things are getting harder with the MB. Do you think the industry might be trying to evolve? I’d say MB is not quite as easy as it was (definitely compared to a few years ago according to the ones who have been doing it a long time) but there is still lots of money to be made – it’s just that I’m not putting in the effort to make the money. I’ve always maintained that it’s a hobby and that too much of it would affect my enjoyment. I do perhaps need to try a bit harder though to get the profits back up! Giving no-lay acca’s another run for their money! So tempting as they are so much less hassle to complete with no laying. I too was disappointed with the offers for the start of the new Prem season. Wondering if all the big players know that come the end of this season there is a World Cup – which will use up a large chunk of their marketing budgets? Hope so! So far, the no-lay acca’s aren’t going as bad as my first foray into them but I can’t say I’m totally at ease with them, compared to doing my lay sequentially ones. It’s true that I’m liking the fact that they take up far less time but…I dunno, I just liked guaranteed profits better! Yes, I too hope there will be decent WC offers – in the meantime, I’ll just chip away on the horses and the current football ones – small profits better than nothing! Can I ask what sort of bank you are working from Weenie? I started MB in June and am up to nearly £800 profit now, but would like to start the no lay accas, but not sure what sort of bank I would need. Any tips? Firstly, congrats and well done on some great MB profits! When I was doing just lay sequential accas, I needed a bigger pot to cover the lays – I think I averaged around £4k-£5k in the exchange (this was when I did between 8-10 accas a week, £40-£50 acca bets). Thanks Weenie. Will def look into the no-lay accas. I still have quite a few sign up offers to do, plus I usually do the weekly clubs paddy, skybet and coral, which is an easy £15+ a week. Not a lot but it all adds up. If I can make an extra £200-£300 per month from MB I will be happy and it will make a huge difference to my savings rate! Regarding savings/ frugality really think you are doing great. When I was saving the most I ever managed was 30/% but you regularly manage more than this . And you seem to manage to enjoy life without being excessively penny pinching. Definitely think you are doing well. I suppose on the months you save less you can say at least you enjoyed that month! 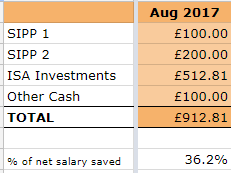 When I’ve done my own projections/calculations, I’ve found that saving 50% gives me a better chance to hit my target. The amount which automatically comes out of my account into my savings/investments when I’m paid is around 25% these days, so I will save that as a minimum each month. At the end of the month, with what’s left, I try to make it up to 50%. Of course, if I’ve spent most of the money going out, then I don’t achieve my savings rate goal. I had considered transferring the whole 50% out so I would always have this savings rate but that just runs a serious risk of me going overdrawn or having no social life whatsoever! I’ve only recently discovered financial independence, and for that matter your blog! Which is very interesting i may add. B2 corresponds with the Ticker, eg in my spreadsheet, AMFW, BLT, etc. Good job on managing a savings rate of 36% in a “social month”! I believe it is important not to sacrifice all of your social life just to get a good savings rate. It is not necessarily the months with a good savings rate that give you memories for life, it is the experiences you have with friends and family that might come at the cost of your savings rate. Don’t be too hard on yourself. Your savings rate is really good and you are still making good progress! Thanks for your kind words of support. Agree, the experiences I have along the way are far more important. Although many enjoyable things in life are ‘free’, spending money can’t be helped, it’s just maintaining the balance and making sure I don’t overspend! Stumbled across your blog while researching for my investing book. First off a 36% savings rate is nothing to be sneezed at, especially considering the average American has a negative savings rate! I noticed that you invest only in stocks any reason why your not using ETFs? BTW that famous quote about two nations divided by a common language is so true. Business and finance are my areas of expertise but I don’t know how many times I’ve been left scratching my head over the British terminology. Totally different from the US. It’s funny as I watch a lot of British TV (expat in Germany) and it’s not that often that I hear a strange term. It wasn’t till I start researching investing, especially property investing that the differences really showed up! It’s great to see your future fund steadily increasing. You’ve hit a “mini milestone” this month with going over another £25k point so that must feel great. I always love it when I hit another £25k point, or even another £5k marker point! Pleased to see that you’re finding time to get out and socialise, particularly at fun events like V Fest. Life is about the journey not the end destination, so I think it’s important to enjoy the process as much as the anticipation of the end result. Thanks and ooh, I hadn’t spotted that I’d reached a mini-milestone! I think I was just looking to aiming towards £150k! But yes, these are worth celebrating – more steps in the right direction. I think it’s important to maintain the social aspect of our lives – I would hate to be in a position where I’ve gotten to FI or early retirement but am no longer in touch with friends while I’ve been too intent on achieving a particular savings rate. Totally agree about the journey and enjoying life being the most important thing. I reached the destination recently (but still find it useful and heart warming reading stories about investment ideas and the journeys of others) Frankly, it became anticlimactic after a month or so and I’m quite ambivalent in how I feel about my new situation. Definitely would not recommend working full tilt until you reach a given point and then suddenly stopping (which is what I did at 53, earlier than I had planned). Your sense of purpose and your identity are all connected to how you are employed. The challenge becomes one of finding new things to do, because at the moment I feel strangely happy when someone asks me to walk their dog or help them decorate.